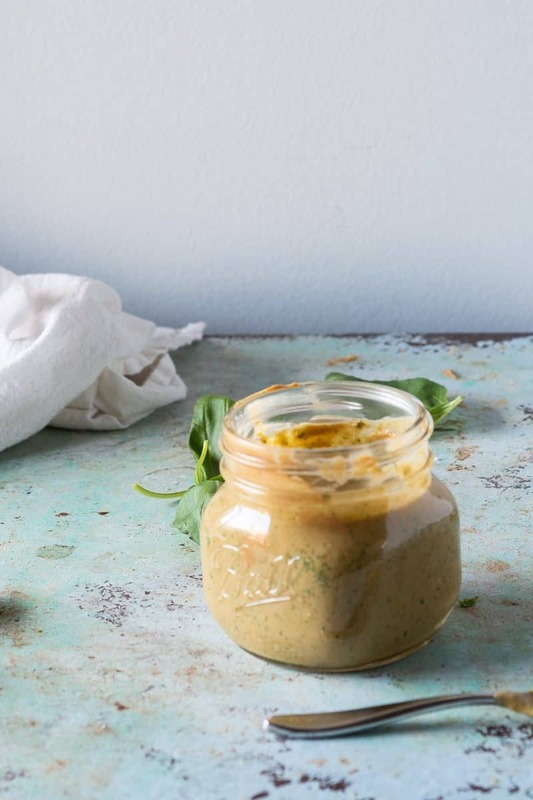 I’ve made various versions of peanut sauce for years (for a long time this peanut sauce, with a generous dose of sesame oil and without coconut milk, was my go-to). I wasn’t sure I needed another one in my repertoire. But, oh my, this particular version is something special. And honestly, I couldn’t believe I hadn’t thought of making it this way before. It’s rich with coconut milk, savory with soy sauce and garlic, sweet from a sprinkle of brown sugar, and spicy from sambal oelek. It gets a burst of acidity from freshly squeezed lime juice. But the thing that separates this peanut sauce from the pack is the generous handful of basil that gets blended in. 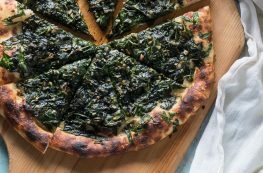 It means this sauce is flecked with green and has a noticeable hit of aromatic basil flavor in every bite. It’s definitely a lick-every-last-drop off the spoon kind of sauce. You can use pretty much any basil variety you like here. Thai basil would be a natural fit, and its distinctive anise notes would work beautifully here. Use whatever is fresh and abundant where you are. 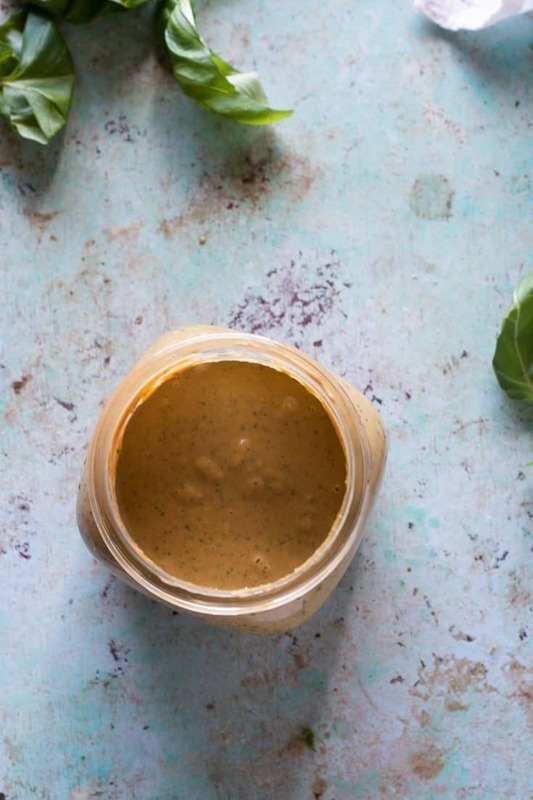 While peanut butter is plenty creamy on its own, this sauce gets an extra dose of creamy richness from coconut milk, which serves as the primary liquid here. 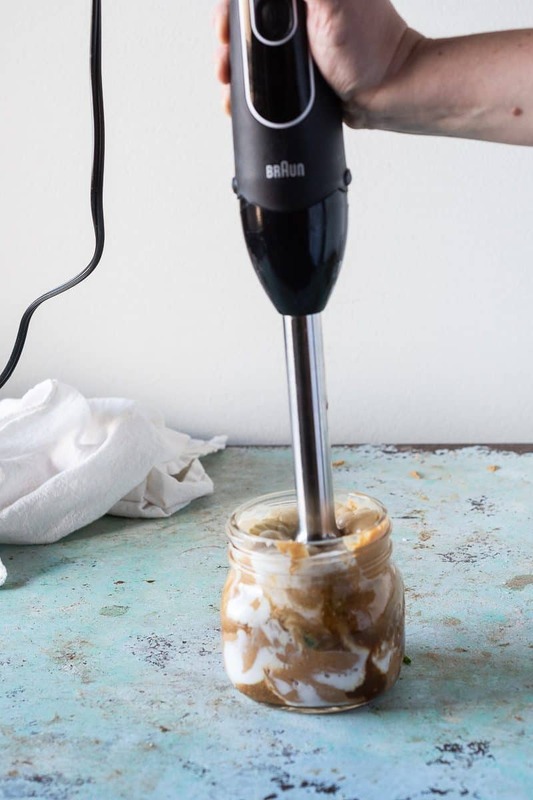 It loosens the peanut butter into a lush, velvety consistency while imparting a subtle coconut flavor that plays nicely with the garlic and basil. I like using sambal oelek to bring the heat in this. 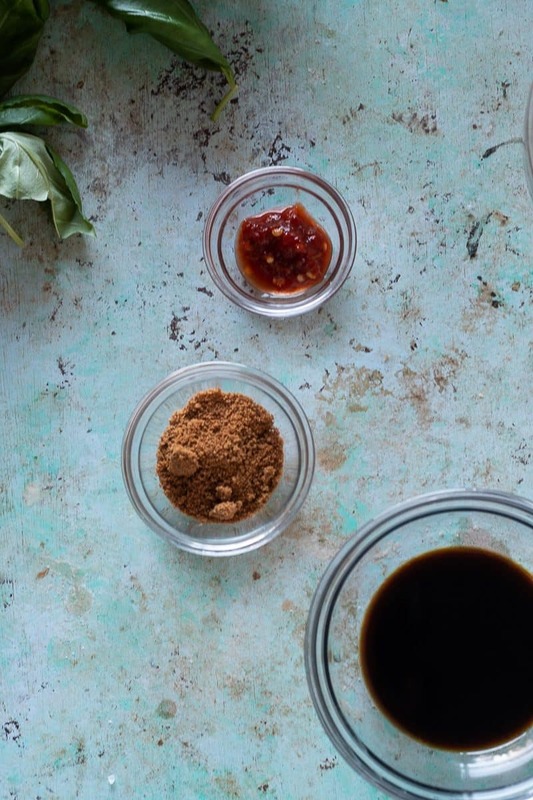 It’s similar to sriracha, and you could certainly use that if you like, but sambal oelek doesn’t have sugar and using it allows you to fine tune the sweetness and spice levels to your liking. This comes together in a couple of minutes. It’s basically a dump everything in and blend job. Then give it a taste. Tweak if you want to. And go ahead and lick the spoon. 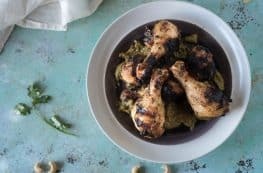 Serve this one on chicken (it would be great as a swap in this chicken with garlicky cashew sauce), on roasted or grilled vegetables (it would be great as a dressing on this grilled cabbage salad), on noodles, or use it as a dipping sauce for egg rolls, satay, or fresh vegetables. Or really, anywhere you like. You’ll thank yourself for making this one. 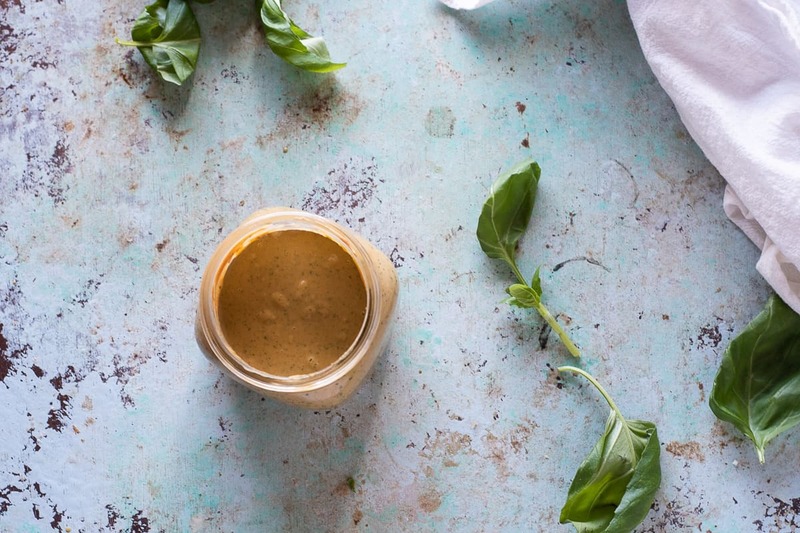 This peanut sauce is quick and easy to make. I like to use a creamy emulsified peanut butter like Skippy here for a smooth sauce, but a natural peanut butter will also work. I like to build this right in the jar I store it in and blend it with a stick blender for easy clean up, but a regular blender will work just as well here. 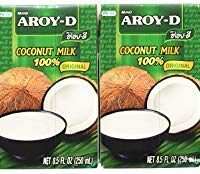 Use an unsweetened coconut milk here (preferably full fat), and do squeeze your own lime juice--the bottled stuff just isn't the same. This is gluten free if you use tamari in place of the soy sauce, and it is vegan as written. The spice level on this is medium. 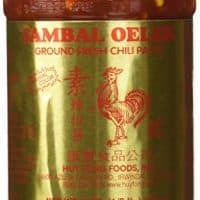 Spice fiends may want to add more sambal oelek, and people with a low spice tolerance might want to reduce it. If you're not sure where you fall, start with less, taste, and adjust to your preference. 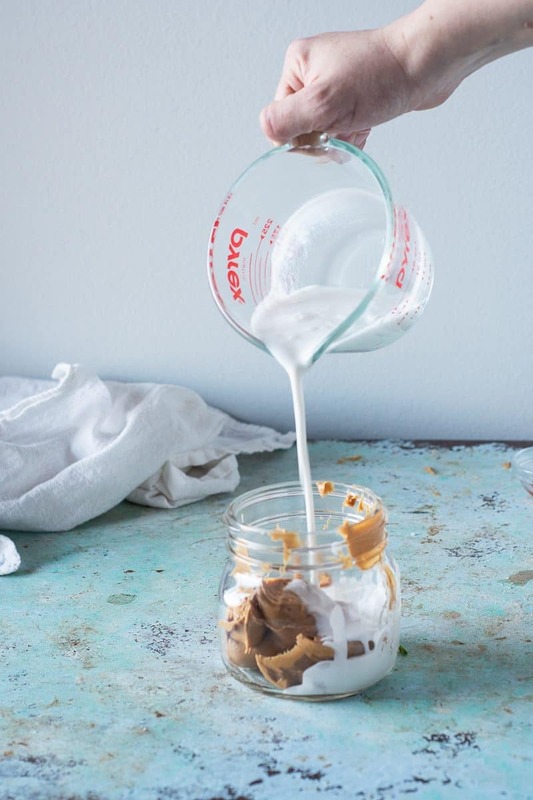 Add the peanut butter, coconut milk, garlic, lime juice, soy sauce (or tamari) and brown sugar to a jar or blender. Add the basil leaves and press them down to make them fit. Blend with a stick blender (or regular blender) until smooth. This keeps in the refrigerator for about a 1 week. Let warm to room temperature if using as a dipping sauce. These seems like the perfect dipping sauce, can’t wait to make this next time we have egg rolls! Keeping this one on hand. It has infinite possibilities!! Dressing, sauce, marinade, appetizer, wing seasoning. Yum! 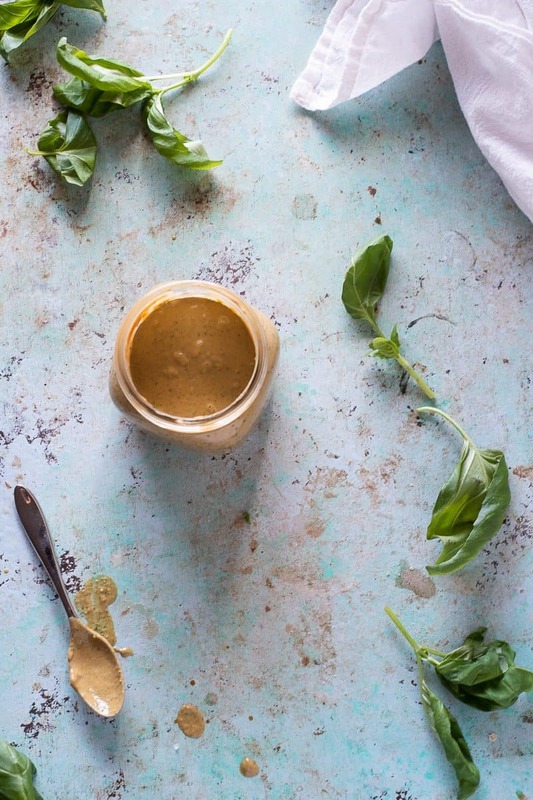 This peanut sauce is so versatile! Looks great and you make it look super easy too! Oh, this looks yummy! 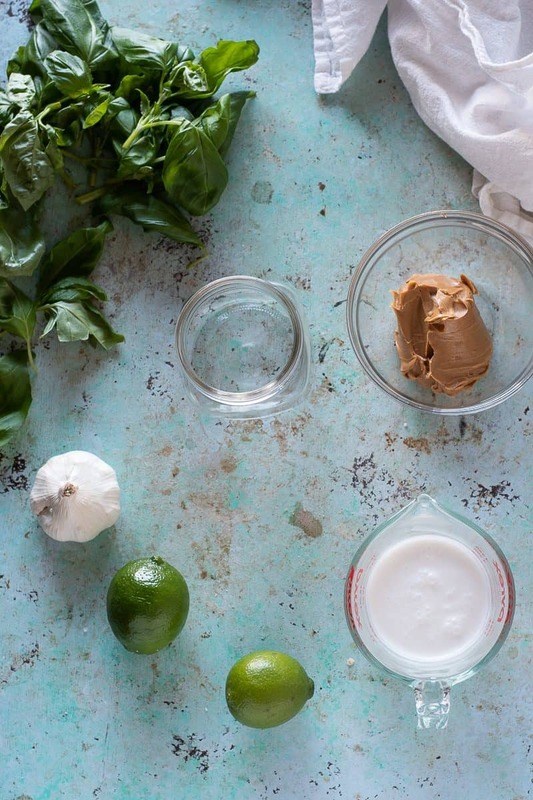 I love peanut sauce with stir fry, but have never thought to add basil! This sounds amazing! Can’t wait to make a peanut salad; that sounds like the perfect lunch for tomorrow! I made this tonight, so excited to use throughout the week in various dishes. I made this tonight, so excited to use throughout the week in various dishes. Thank you for posting such a variety of recipes! Have you tried freezing it? And if so, what was the result? I’m thinking that the basil texture change wouldn’t be noticeable since the sauce is blended anyway. BTW, I really love your posts! I haven’t tried freezing this, but I don’t see why you couldn’t. I’d probably freeze it either in ice cube trays or in a flat layer in a ziploc bag so that you could thaw small amounts more easily.